Map of Okeanos Explorer's cruise track line for the expedition. Image courtesy of the NOAA Office of Ocean Exploration and Research. Download image (jpg, 40 KB). This expedition will commence on January 20, 2017, in Honolulu, Hawaii, and will conclude on February 11 in Pago Pago, American Samoa. Operations during the expedition will include the use of NOAA Ship Okeanos Explorer’s deepwater mapping systems: Konsberg EM302 multibeam sonar, EK60 split-beam fisheries sonars, ADCPs and Knudsen 3260 chirp sub-bottom profile sonar. As part of the Okeanos Explorer’s "Always Exploring" model, these sonars or a subset of these sonars will be operated at all times, 24 hours per day, throughout the cruise, allowing for continued exploration. In addition to the operation of the ship’s sonar suite, this expedition will be the fifth cruise to test telepresence-enabled mapping operations on the Okeanos Explorer. Continuous telepresence-based remote participation for mapping operations will be performed using the ship’s high-bandwidth satellite connections for real-time ship to shore communications. After leaving Honolulu, the ship will transit to waters offshore of the Kingman Reef and Palmyra Atolls areas of the Pacific Remote Islands Marine National Monument (PRIMNM), carrying out a focused survey on a Navy red dot seamount target. From there, the Okeanos will travel to the Jarvis Island Area of PRIMNM and then transit along the Clipperton Fracture Zone to the eastern Phoenix Islands Protected Area (PIPA). These waters include several unmapped seamounts as well as the Hadal Hole and Winslow Reef, which will also be targeted areas for focused mapping. Transiting out of PIPA, the ship will move through waters near Tokelau before finally arriving in Pago Pago, American Samoa. The seafloor mapping operations conducted during the expedition will be used to prepare for remotely operated vehicle (ROV) dives to occur during upcoming expeditions in 2017. 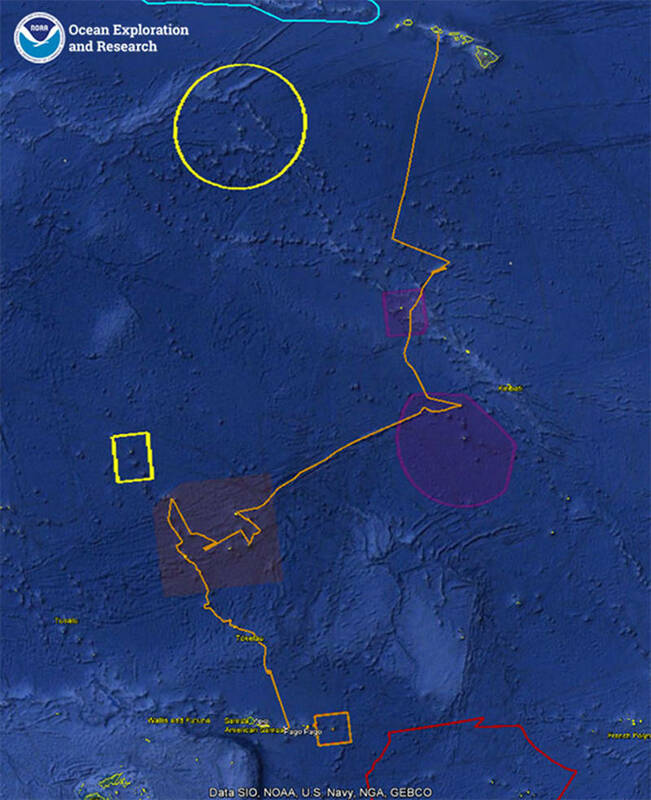 The mapping operations will also support an array of scientific, management, and exploration objectives including, but not limited to: contributing to geological understanding of remote areas of the Pacific Ocean, characterization of seamounts within the Prime Crust Zone thought to be areas of high concentrations of deep-sea minerals, identification and characterization of vulnerable marine habitats; and acquisition of data to support priority Monument and Sanctuary management needs. The Okeanos Explorer team is planning a port call at Kanton Island, the easternmost island within Kiribati territory. This port call is part of a continuing effort to engage stakeholders and to enhance regional cooperative partnerships. Serving as a ship of opportunity, the Okeanos Explorer will also serve as a platfrom from which to deploy ARGOS floats along the ship's track line. These ARGOS floats are part of a global array of free drifting buoys that remotely record physical characteristics of the ambient ocean. Joining the operations team will be two Explorers-in-Training, Jay Chitnis and Sarah Rosenthal, both of whom are based out of Hawaii. During their watches, they will be responsible for monitoring data acquisition, data processing, and assisting with data management. While onboard the Okeanos, Jay and Sarah will also create and carry out capstone projects to document their experience and to help advance the overall mission. The Okeanos team is very excited to have future explorers working alongside! Also joining the operations team will be Jason Meyer and Dan Freitas as Lead Watchstanders and Survey Technician Charlie Wilkins. Mike White will be serving as the onboard Expedition Coordinator/Mapping Lead. All collected data will be available in NOAA’s public data archives within 60-90 days of the conclusion of the cruise and can be accessed via the OER Digital Atlas.